Money in the Garage: Geico Insurance, Nissan Versa and yard sales..perfect together! Geico Insurance, Nissan Versa and yard sales..perfect together! In a sort of good news/bad news story, last week my son totaled his beautiful little 97 Honda Civic. Unable to negotiate a sharp turn on a wet street, the Honda slid across the slick road and crashed straight into a telephone pole. Airbags were deployed and pieces of the front end flew everywhere! Luckily, Sonny Boy was securely buckled in, and other then being shook up and a little sore, he was uninjured. As I later told him, that little Honda Civic took the brunt of the hit, saving Sonny Boy from serious injury! 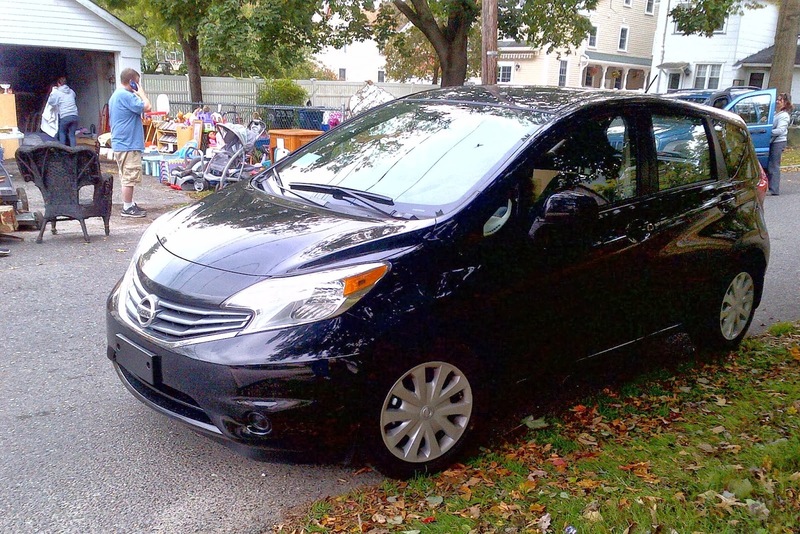 Nissan Versa Note - great for yard sales! After learning about Geico's rental car policy, Sonny Boy and I headed down to Enterprise Rent-A-Car. We picked up a 2014 Nissan Versa Note. I warned Sonny Boy that this could be sending him the wrong message....crash a car and get a fun little 2014 Nissan to drive around in! He told me that he didn't look at it quite like that, but the kid has taken a liking to the Nissan Versa. He even hinted that we should buy it! I have to agree with him, it's a great little car to tool around town in. Naturally, I took it out yard sailing on Saturday and had a blast driving it! After spending the morning darting from sale to sale, I've learned there are huge benefits to yard sailing in a small car. Maneuverability is the foremost advantage. Garage sales are synonymous with heavy traffic and tight parking spots. With the little Nissan Versa, I was zipping in and out of tight spots with ease! While I love my truck, it's a lot easier maneuvering a small car like a Nissan through busy suburban streets. Don't get me wrong, once I return the Versa to Enterprise Rent-A-Car, I'll go back to my good, old truck. But I can definitely see the benefits of owning a small, fun car like a Nissan Versa! A big IKEA table fits! You would think that one possible setback to a small car would be limited cargo space. But this wasn't an issue in the Nissan. As an example, I finally bought that table I've been looking to wrap packages on. I've been on the look-out for one since my table story from back in the summer. At long last, I finally found a nice IKEA table at a garage sale on Saturday! The seller charged me ten bucks for it. At first, I thought I would need my truck to haul the six foot table. But instead, I just dropped the Versa's back seats and the table easily slid into the back of the car! It was awesome! With the back seats folded down, I had almost as much cargo space as in my truck. Continuing my crush on the little car, I piled in the entire family to head to nice restaurant over the weekend. We had Mrs. Dude and two young twenty somethings sitting comfortable in the back seat with no problem. It was a blast for all! The Versa also brought me some good luck. I found plenty of good garage sales and bought a lot of stuff! Part of my motivation is the realization that the garage sale season is winding down. As we approach Halloween and Thanksgiving, the sales will become fewer and fewer. Now is the time to buy, buy, buy to build up enough inventory to get through the winter! So that's what I did-packing the Versa with various garage sale treasures. Since I had so much fun in it, I am hoping Geico doesn't pull the plug on me, and I'll get to keep the car for at least one more Saturday. Either way, both Sonny Boy and I are gonna miss that little car when it's time to return it to Enterprise Rent-A-Car! In addition to the IKEA table, another solid gold find was the shortwave radio seen here. 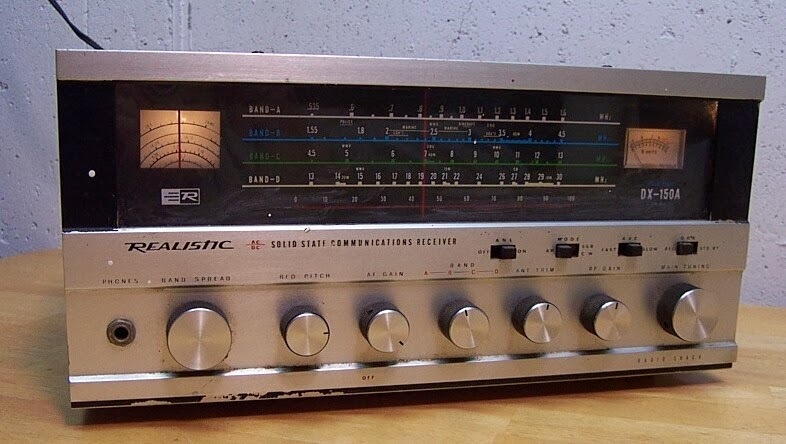 This was found at a garage sale advertised on Craigslist that specifically listed shortwave radios for sale. This grabbed my attention immediately. I love to flip old radios and usually make nice money doing it. Because of this, I made it my first stop of the morning and scooped up this vintage Realistic Shortwave radio for ten dollars. I should have no problem flipping it for around $60 on eBay. I also bought a few other items from the guy, including a five gallon plastic gas tank. Other bloggers have pointed out an active eBay market for these old gas tanks, so I am going to test the waters. Naturally, I'll report my findings here on the site. So the Fall is turning out to be quite eventful around here....good news and bad news. Hope your Fall garage sale season is going well and is accident free. Most importantly....don't forget to wear your seat belt! And if you are in the market for a great little car-definitely consider the new Nissan Versa! Thanks Pam, zipping around in the rental car has seemed to have cheered him up - Ha! I did check out your site, learned a few things too. You're doing some great flips. I'll be coming back for more! Thanks for the nice words...Dude! I am so glad your son was not hurt! That could have been a serious accident. I love my Honda Civic and it's great for saling on Saturdays. I can fit a lot of stuff in my Honda Civic; but every once in a while, I have to make a return trip with the truck to pickup something. Recently, however, we've been taking hubby's truck which is great for larger items, but not so great for parking. Love reading your blog! Thanks! He's doing great..probably a little too great : / HA! Honda Civics are the best! With our kids, I think we've been through four Honda Civics now, and will probably get Sonny Boy the 5th Civic to join the family fleet. They are great little dependable cars! You know what I mean, since you own one too. I don't know how you feel, but when one of our Civics needs an occasional repair, it doesn't seem to bug me like other car repairs. I thinks it's because you know it's a good investment in a dependable car. And the truck is always indispensable though, right? Gotta have it for those heavy Saturday yard sale hauls...lol! Thanks for the nice words about Sonny Boy and for liking the blog too....Dude! To tell you the truth, when I went with them a few years ago, my rates really went down. So they are worth a phone call just to comparison shop. Of course, now with my son's "bumper thumper" my rates may shoot back up, but we'll see. The Nissan Maxima gets about 19mpg in the City and 26mpg on the Highway, Insurance isn't as high as it can be due to it not being a Sports car unless you buy the sport upgrade, although I am not quite sure the price because it may vary with age and gender. I've liked Nissan waaay back when they were called Datsun here in the States. (They should have changes their name) . Always good quality cars.